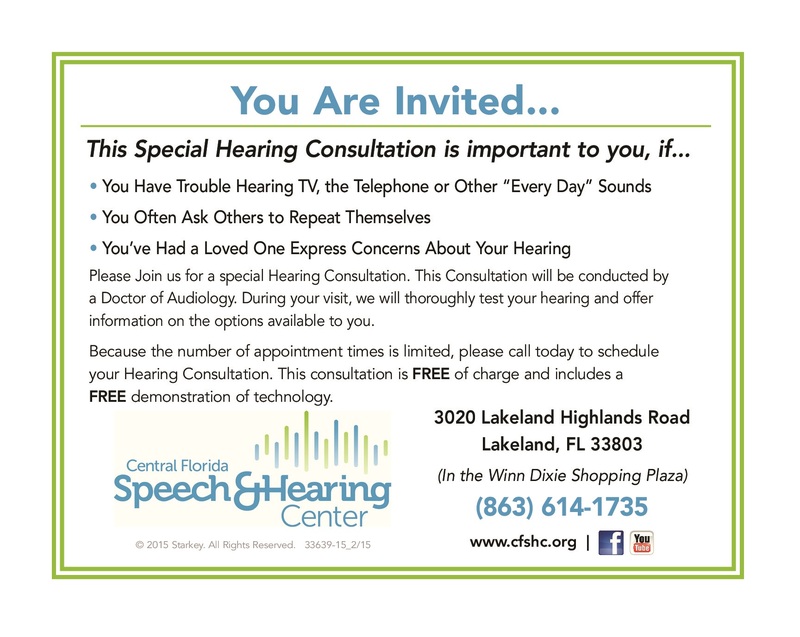 Join Us for a Special Hearing Consultation! 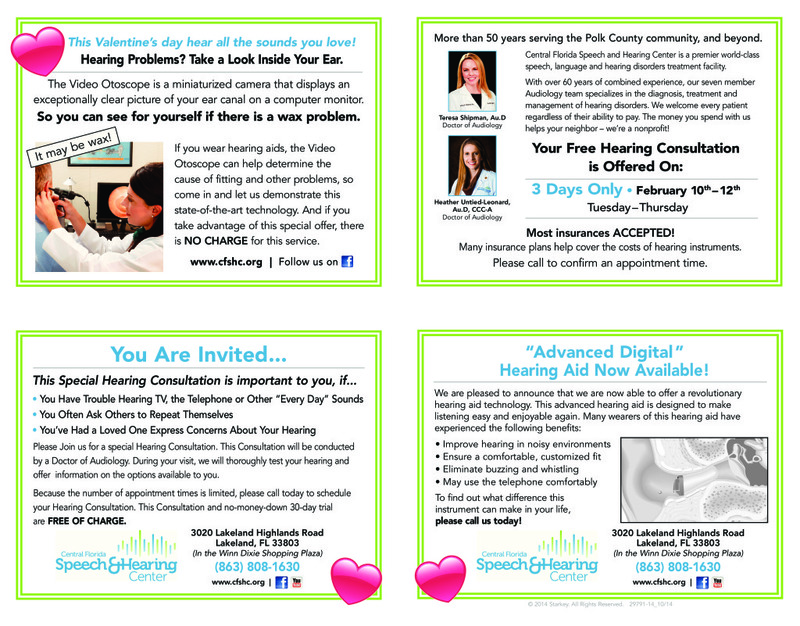 Join Us for a Special Hearing Consultation! Do you have trouble hearing TV, the telephone and other “every day” sounds? Do you often ask others to repeat themselves? If so, then this free consultation is important for you! Call 863.686.3189 to schedule your appointment today! Free Phones! Upcoming Phone Distribution Dates! If you are a Florida resident with a certified hearing loss, a new telephone can help make conversations easier. The phone is offered at NO COST through the nonprofit Florida Telecommunications Relay, Inc. Phones will be distributed at the following dates, times and locations! Don’t miss these opportunities! 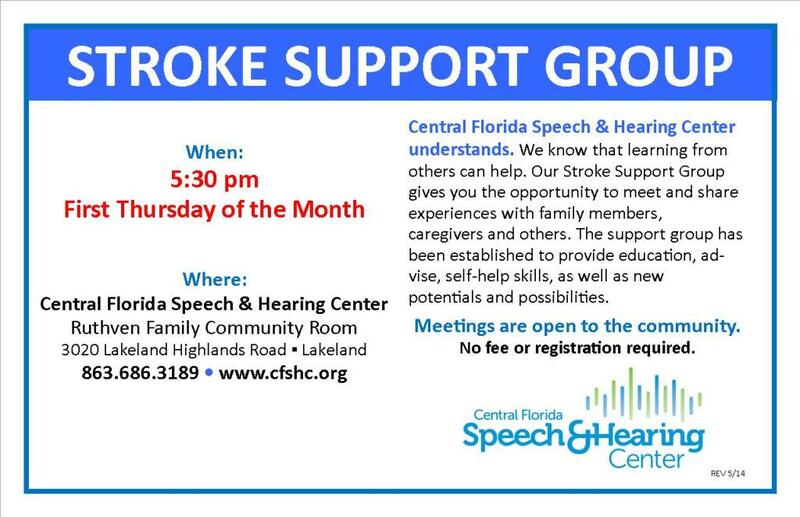 Contact Central Florida Speech and Hearing Center at 863.686.3189 for more information! 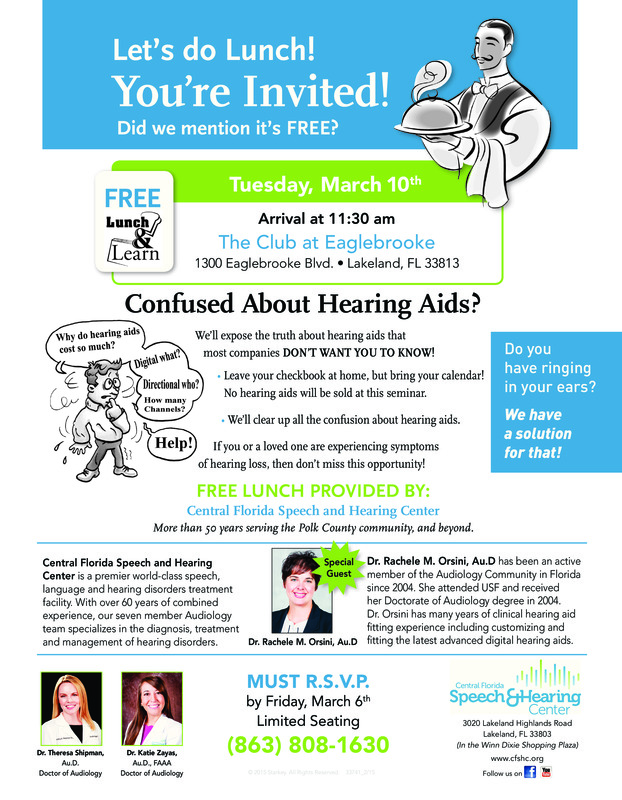 Check out this FREE Lunch and Learn provided by Central Florida Speech and Hearing Center! 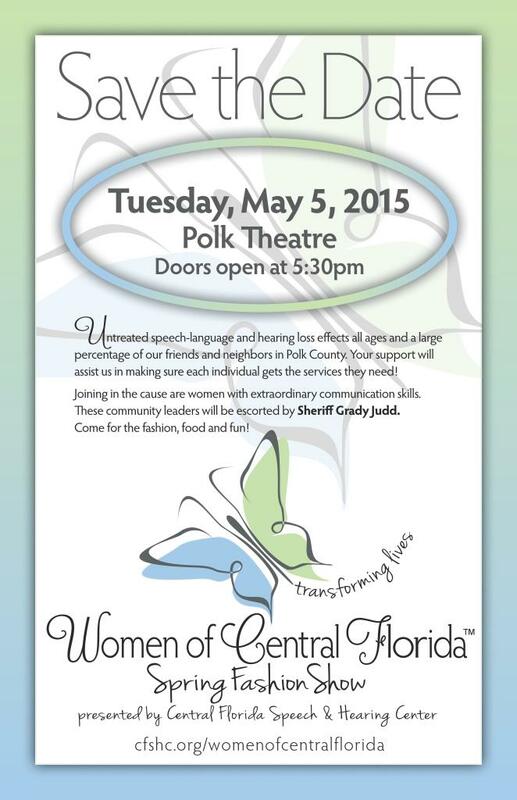 See the flyer here for more details and call (863) 808-1630 to reserve your seat today! Click here to view the Save the Date! Don’t Forget about our Great February Specials! 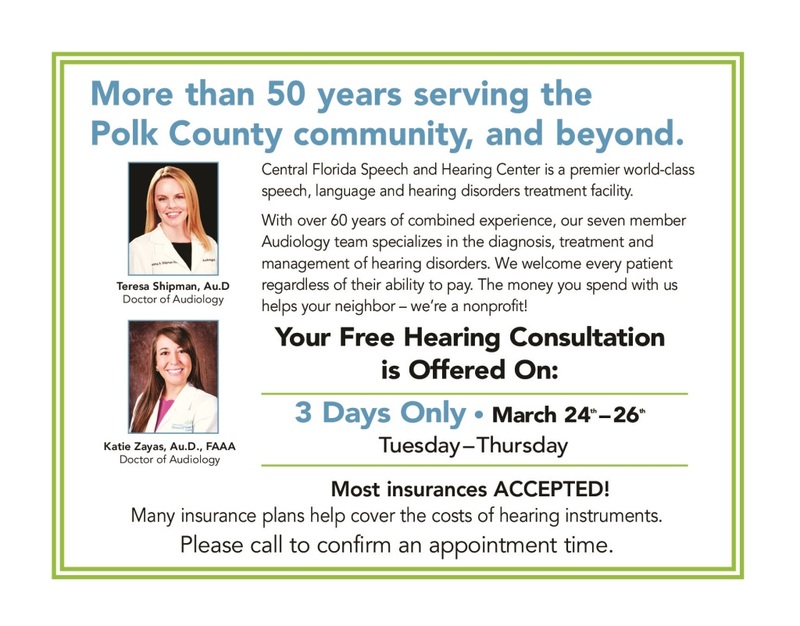 This February, we are offering specials for services, including, free otoscope testing, free hearing consultations, and more! Click here view the flyer and learn more! Do you know someone who has a hearing loss? FREE Amplified Phones being distributed at the Winter Haven Library today (February 2nd) from 10 am to 3 pm! Phones will also be distributed at the Brandon Chamber on Friday, February 6th from 10am to 3pm! Stroke Support Group meets this Thursday, February 5th! Join us for a “Caring and Sharing” meeting on Thursday, February 5th at 5:30pm. Our stroke support group gives you the opportunity to meet and share experiences with family members, caregivers and others. The meeting with take place in the Ruthven Family Community Room! Meetings are open to the community!